The hummingbird visits the iochroma outside the window at left every day midmorning to early afternoon. Sir Oliver Skardy & Fahrenheit 451 – Fame un spritz. I found the lyrics to this tune, which I posted here in 2010 and recently reposted over at Tom’s Garden. I make out the first line to be “Make me a spritz, make me a spritz, make it good with a slice of lemon.” But the Italian is unconventional, I guess a Veneto dialect, and if anyone more accomplished than me can provide a full translation I would love to hear it. This would be a good tune for a ukulele. Rats review NYC pizzas : Will Grimaldi’s sue the rats? The mixed up brothers of Bogotá : Farce or tragedy? She was not much of a looker. Very, very plain. Jane Austen wasn’t very good looking. She’s the most inspiring, readable author, but to put her on the cover wouldn’t be very inspiring at all. It’s just a bit off-putting. I know you are not supposed to judge a book by its cover. Sadly people do. If you look more attractive, you just stand out more. Sadly, we do live in a very shallow world and people do judge by appearance. This old post about overnighting at Heathrow airport is pertinent again today, as many travelers are currently stranded by snow. Want to send an e-mail to your future self? Futureme.org is there for both of you. Along the same lines, it is convinced I’m a Jack Johnson fan no matter how many of his tunes I reject. I think those genomes could use a little more tinkering. Slow to blog, slow to answer e-mails, what is wrong with this guy?? Yep, there has been a slow-down here at Right Reading in the past few months — which I think is temporary, so please bear with me. I am been working pretty obsessively on a book project, about which more in due time. Today I left this comment on my blog post where people comment about my primer on getting a book published. It was the 102nd comment in that thread, which is quite a lot for this blog. “It’s only books and shelves . . .
. . . but I like it.” That’s the title of a story in the Independent about Keith Richards’ forthcoming book Life, in which he confesses he would have liked to have been a librarian. This house on the beach in Venice, California, has no doors (on its upper story), and the walls are made up of bookshelves and storage units. Read about it at BLDG BLOG. My nomadism is concluded for the moment, and I will resume more regular blogging tomorrow morning. According to Graham at Linguism, some people think Belgium is an adjective. Well, whatever. What struck me about his post was his claim that “most people find it difficult to name ten famous Belgians without falling back on Tintin and Hercule Poirot.” Which I expect is true. Right Reading is taking some time off. If circumstances allow I may make the occasional post, but posting will be, at best, light for the next couple of weeks. After that: recharged! This is via Kareem Abdul-Jabbar’s twitter account. He writes “These ladies are amazing athletes -even back in the day!” Be patient — the fun starts about one minute in. 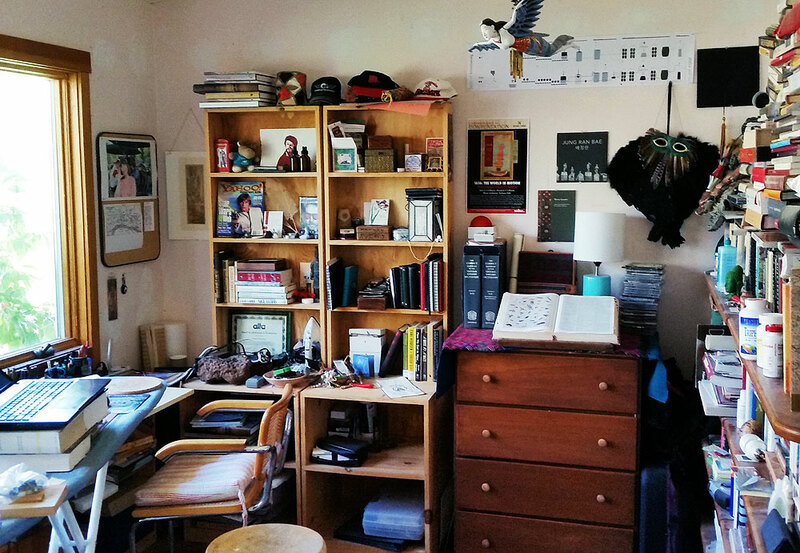 Writers’ desks : Not sure who most of these are, but still . . .
Having dunked my trusty Canon A620 in the waters of Pomonkey Creek, I was reduced to shooting this ghost type in Alexandria, Verginia, with my cell phone. Today is Monday, April 22, 2019 4:56 am (U.S. central time).